Sharp introduced three new smartphones today, all for Japanese carrier NTT DoCoMo. The trio of handsets are built using the EDGEST design that minimizes top, bottom and side bezels. To prevent repeating ourselves, we can tell you now that all three phones are powered by the Snapdragon 808 chipset, containing a hexa-core 1.8GHz CPU and the Adreno 418 GPU. The first model, the Aquos Zeta SH-01H, features a Gorilla Glass 4 protected 5.3-inch IGZO screen, with a fast refresh time. The resolution is 1080 x 1920 (FHD), which works out to a 416ppi pixel density. A fingerprint scanner is on board. 3GB of RAM is inside along with 32GB of internal memory. A 13.1MP camera is on back, with an aperture of f/1.9 and phase detection autofocus. A front-facing 8MP snapper is ready to shoot selfies, and handle video chats. IP certification of 55/58 means that the phone does offer a level of protection from water and dust. A 3100mAh battery keeps the lights on, and Android 5.1 is pre-installed. The device will be offered in blue, black and pink, and measures 7.9mm thick. The Aquos Zeta supports 4G LTE, 3G, Wi-Fi, and Bluetooth 4.1 connectivity. The handset will be available in November, although pricing is unknown. 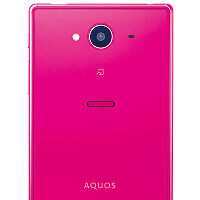 The Sharp Aquos Compact SH-02H is a compact version of the flagship model, sporting a 4.7-inch IGZO display. With a 1080 x 1920 resolution, the pixel density is 469ppi. 3GB of RAM is inside, along with 16GB of internal memory. The 13.1MP rear-facing camera has the same features found on the back shooter on the full-size model, although the front-facing camera is 5MP on the compact variant. There is also a lower capacity 2810mAh juicer aboard, and an IP certification of 65/68 is present. This unit is a little thicker (8.9mm) than the Aquos Zeta, and also supports 4G LTE, 3G, Wi-Fi, and Bluetooth 4.1 connectivity. Android 5.1 is pre-installed, and the phone will launch this December in gray-yellow and blue-black. Lastly, a version of the Sharp Aquos Compact is being offered for Disney fans. Called the Sharp Disney Mobile (DM-01H), the device carries the same exact specs as the SH-02H, but contains free Disney content and branding. It will be launched in January, available in Sparkle Blue or Sparkle Pink. Wow, Sharp Aquos compact has better offering than the Xperia Z5 Compact!! It's certainly good competition but too early to say if it trumps the Z5 Compact overall. Camera quality and battery life due to that higher resolution display are the two biggest questions (110mAh larger battery won't be enough to offset the higher display unless it is very power efficient). Good to see more RAM though. I'm just glad that there's going to be a viable alternative to the Z5 Compact. I have owned sharp aquos crystal for a year now. I have dropped it on tile straight on it's face. Did not break. Does the sharp aquos crystal worth the money? I love mine for numerous reasons. The price is great only $150 (now probably even less). The size of the phone is perfect and 5" screen is just the right size. Stock Android is another big plus going for Aquos Crystal. There still isn't a phone on the market that can replace my Aquos Crystal. Complaining about it's best feature? *claps slowly* The only thing wrong with these phones is only being available in Japan. "The only thing wrong with these phones is only being available in Japan." That's so true!!! PA why you're not post Xperia Z5 DXOmark test? That sparkle pink one would give the pink iphone 6s a run for its money especially with Minnie on it! Yup. This is how to do a phone with a 4.7 inch display. Japan only -_- Otherwise, Z Compact series would've finally had a worthy competition with the compact model. Really? Ahhh that's a shame. The only bad thing about these phones is that the fingerprint scanner is of the swipe-kind. Other than that, make it worlwide and it has the potential to be successful!! Yuck, swipe fingerprint? Still, the rest of the specs sound very enticing indeed. So what Japan only. Just buy one. They work worldwide. Yeah, not ideal for some. First, import taxes will jack up the price and second, if there's a warranty issue it'll be even more of a chore than usual to get it sorted. Also, these might not support the correct LTE bands (do they support bands 20, 7, 3? ).